Sustainability is only going to become a bigger issue in the broadest of contexts, so it’s little surprise to see a promotional body publish a book promoting sustainable practices in its industry. I guess that means this was probably always going to be a touchy-feely book to generate a feel-good factor among consumers for California wine. And it may well achieve that. 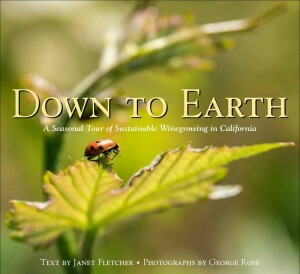 A double-page spread outlines sustainable, organic and biodynamic definitions and lists websites of the main sustainability programs, notably the ones initiated by the Wine Institute. Similarly-monikered programmes in other countries may differ somewhat in their recommendations or requirements, so have in mind the book refers to California vineyards. I like the way the book travels through the seasons. It seems a good way to engage the reader in the rhythm of grape growing and the agricultural imperatives that drive production. Within the seasons, a number of producers each tell their story. It’s arguably an easy mechanic to give individual producers a chapter each rather than, say, look at each sustainability issue and argue who is doing well, or less well, on each parameter. And giving the views of 15 California producers who already have active sustainability programmes, some of them long-established, may not be especially representative of a whole industry. But one assumes they’ve been chosen, at least partly, to each accentuate different aspects of possible sustainable practices, which works well. For example Gallo discuss water reduction, Sangiacomo discuss GPS-facilitated precision to target sprays and nutrients where they’re needed rather than a blanket approach across the whole vineyard parcel; J. Lohr discuss compost. It’s a pretty book. There’s some wonderful photography by George Rose, in fact it’s more photography than text. California clearly has some beautiful places to be growing grapes. All the more reason to sustain them beautifully. I’m not entirely sure who is going to read this. Rather, who is going to pay to read it. Is that because I’m reviewing the book in the UK and it relates rather personally to the California industry? I can imagine the featured producers giving it away to perceptibly important visitors, or adding it into their cellar door sales mix, but I’m not convinced it’ll be a mainstream seller. The book gives a flavour of the breadth of potential measures that have some sustainability value, from waste reduction, water-use reduction, energy-use reduction with a growing proportion of resource use being from renewable sources; from avoiding synthetic fertilisers and pesticides, to actively training employees on these issues, and many others. Not all are big financial investments and savings, some are small, sometimes low-cost things that add a bit more well-being, or bring more biodiversity. The list of things that offer additional sustainability value is long. This book shows that. And it shows how these particular producers are moving along the path towards increased sustainability of practice.